The first new Fiat sold in the United States in 27 years was delivered at Criswell's Fiat of Gaithersburg Studio earlier today. The delivery officially marked the return of Fiat back to the US market. The happy owners are Shaun and Nanci Folkerts, a well known couple in the Fiat enthusiasts' world. The Folkerts purchased their Fiat 500 Prima Edizione back in July 2010, during the Fiat Lancia Unlimited car club's national convention called the Fiat Freak Out. Their car, Prima Edizione number 11, is the first new Fiat offered for sale to the public since the car company left the US market in 1984. 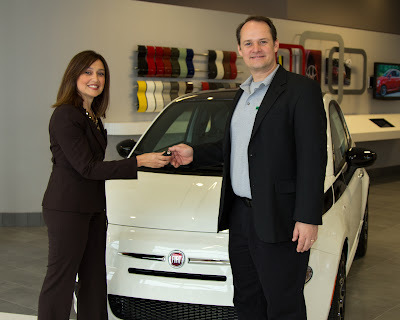 Fiat Brand chief, Laura Soave, was there to hand the keys to the Folkerts and celebrate the return of Fiat to the US market. The event was kept semi-private and personal. Here is some great news, now that the first Fiat 500 Prima Edizione is delivered, Fiat is releasing the remaining 488* Prima Edizione cars for delivery. It won't be long now! For those who don't have a Prima Edizione waiting for them, dealers are receiving inventory daily. 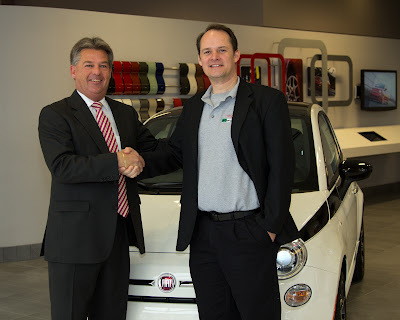 Criswell Fiat of Gaithersburg has them in stock, so check them out and their Studio. Fiat North America has begun delivering the first Fiat 500 Prima Edizione models to customers throughout the United States this week. These limited-edition 2012 Fiat 500 models were offered to Fiat enthusiasts in the U.S. as a reward for their years of steadfast loyalty to the Fiat brand. The 500 special-edition models represent the first Fiat vehicles to be sold in the U.S. since 1984. “I’ve been waiting almost 28 years for this model to arrive, so I would drive anywhere, anytime for this Fiat 500,” an elated Folkerts said. “The fact that these cars are reserved by a father and son, a husband and wife, and even a high school girl illustrates the strong appeal of this model to a broad array of customers who identify with Italian design, modern technology, fuel efficiency and overall value,” Soave said. Soave was ecstatic as she handed the keys of the No. 11 Prima Edizione to Folkerts today at Fiat of Gaithersburg. It also was a special moment for dealer Harry Criswell. The Fiat 500 Prima Edizione is exclusively available in three colors: Bianco, Rosso and Grigio (Gray). These limited-edition Fiat 500 models are equipped with a manual transmission. 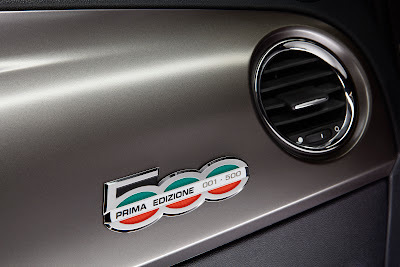 Designed as a collector vehicle, each Prima Edizione will feature a sequentially numbered vehicle identification number (VIN) and unique numbered matching badge on the instrument panel. *Prima Edizione numbers 1 through 10 and number 500 were reserved for the company, leaving 489 cars offered to the public. "Fiat is releasing the remaining 488 Prima Edizione cars for delivery." Congratulations to Shaun, Nancy and Madeline Folkerts! What an awesome day! Shaun- Fiat owners around the world are so proud of you and all the good will you have done for the Fiat community of enthusiasts!If anyone deserves to have the very first new Fiat, it would be you!! Sincere thanks to Laura Soave, the entire Fiat/Chrysler team and the incredible new dealers. All of you have worked so very hard to bring the wonderful Fiat 500 to North America. We look forward to a bright future together, bringing the passion back to the North American driving experience! Prima Edizione numbers 1 through 10 and number 500 were reserved for the company, so 489 cars were offered to the public. I'll mkae a note of that so as not to confuse anybody. the Folkerts were the first to sign up way back in July and they've waited longer than everyone else. I think most would agree, it's the right thing to do. Hang in there, our cars are coming. Once you see and start driving it, the waiting will fade into memory. "Congratulations to Shaun, Nancy and Madeline Folkerts! What an awesome day! Sincere thanks to Laura Soave, the entire Fiat/Chrysler team and the incredible new dealers. All of you have worked so very hard to bring the wonderful Fiat 500 to North America. We look forward to a bright future together, bringing the passion back to the North American driving experience!" John, well said and I agree! I am very happy for the Folkerts. The wait here has not been so long and I think the FIAT NA folks have worked at keeping us entertained during the wait. For me, I find path to building and delivering a new car like this to be overwhelming. I've enjoyed the pix and the poster and the chance to be in the just posted video was certainly novel and fun. No, I could not, on the drop of a hat, fly to LA for either the ad or the studio opening, no big deal. As this transitions to the dealer I am nervous. There are some good dealers, I can see that... got my fingers crossed. Hope to goto Reno Hot August Nights; it's time to start up a Cinquecento Car Club - Northern California! Ditto that on the Nor Cal Club. You and I could be founding members.